Tholer Saryoni, a Dunmer priest, is the Patriarch and Archcanon of the Tribunal Temple, as well as the Chancellor of Vivec. He can be found in his office in the High Fane of Vivec's Temple Canton. The office is locked from both sides, and the front door is in plain sight of an Ordinator guard. The rear entrance from the Hall of Wisdom is unguarded, but beware that it will lock behind you, so if you visit Saryoni early on in the game and he doesn't give you the key, you'll need to find a way to avoid being spotted picking the lock to exit. Saryoni provides the final quests for the Temple, as well as arranging for you to contact Vivec himself near the end of the Main Quest. Saryoni is the author of Saryoni's Sermons, copies of which can be found in many locations around Vvardenfell. The original manuscript is in the care of Llirala Sendas, in her shack at the Sanctus Shrine in the Sheogorad Region. This book has the distinction of being the most valuable in the game (50,000 gold). Hortator and Nerevarine: Make the arrangements to meet the god Vivec and receive the plan to defeat Dagoth Ur. Control the Ordinators: Talk with Archcanon Saryoni on how to control the Ordinators. Malacath of the House of Troubles: Start the Pilgrimages of the Four Corners by visiting the Statue of Malacath. Mehrunes Dagon of the House of Troubles: Renew the pact with Mehrunes Dagon by visiting his shrine. Molag Bal of the House of Troubles: Renew the pact with Molag Bal by visiting his shrine. Sheogorath of the House of Troubles: Visit the Statue of Sheogorath to finish the Pilgrimages of the Four Corners. Ebony Mail: Retrieve this artifact from the shrine at the top of Mount Assarnibibi. "Please leave. These are my private quarters." "Thank you for coming, %PCName. You know the Temple's doctrine on the Nerevarine. Perhaps it is time to change that doctrine." "The Temple must protect the people from false doctrines. And your association with Imperial intelligence makes your motivations and integrity suspect. But you have been chosen Hortator and Nerevarine by the Dunmer people. And we have reached a crisis with Dagoth Ur. We can no longer defend the people against the awakened Sixth House. You and your prophecies may represent our last hope. Our situation is desperate. But I would rather have you hear the details of our situation, and the circumstances leading up to that situation, from Lord Vivec himself. He has asked to see you. Would you agree to a private meeting with him, and hear in person what he has to say?" Yes, I will meet with Vivec [Archcanon's Private Key has been added to your inventory. Secret Palace Entrance Key has been added to your inventory.] "Good. Here are two keys: one to the private back entrance to my quarters, the other to a locked entrance to Lord Vivec's palace. I regret that, at present, the Ordinators are not completely under my control, so, for now, I'll ask you to avoid confrontations with them. Lord Vivec is expecting you. His Lordship is remarkably patient, but perhaps it would be better not to keep him waiting." No, I don't trust you "I'm sorry. I understand. Then we have nothing further to discuss at this time. I will not apologize for the Temple's actions against you, or against the Dissident Priests. But I do believe it is time for such hostilities to stop. I regret that, at present, the Ordinators are not completely under my control, so I cannot guarantee that you will not be harmed. 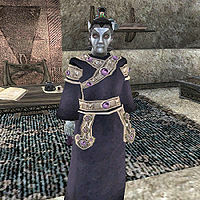 But if you change your mind, and are willing to meet with Vivec, please return to me at any time." Saryoni is also the author of Yngling's Letter. Esta página foi modificada pela última vez à(s) 12h27min de 16 de fevereiro de 2016.